This is Room 91B. 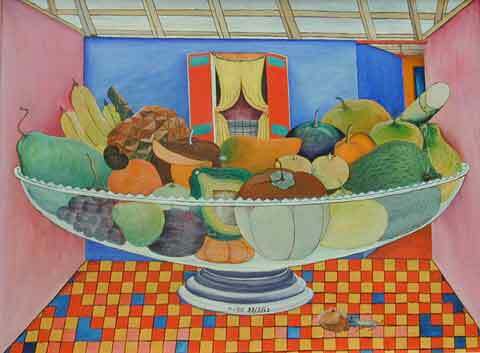 A Haitian Painting by Pauleus Vital. Pauleus Vital was born in 1918 in Jacmel, Haiti. As a young man he was a boatbuilder and moved to Port-au-Prince at age 21 to pursue his occupation. He began to paint in 1956 after he was introduced to the Centre d'Art by his half-brother, Prefete Duffaut. 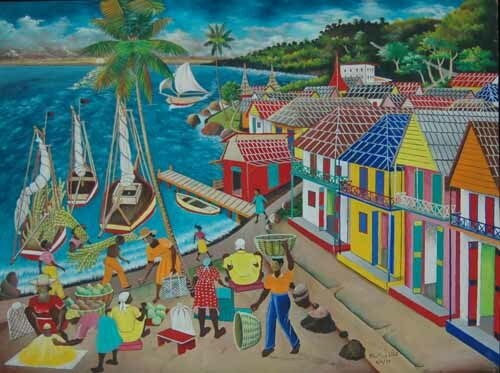 By 1959 he was an accomplished artist and moved back to a modest home across the river from Jacmel where he painted his richly detailed paintings in a peaceful courtyard under a canopy of banana leaves. His subject matter varies, from everyday scenes of Haitian life to subterranean vodou ceremonies populated with bizarre and colorful creatures. He died in 1984 while undergoing heart surgery in Haiti. He was a gentle, soft spoken man. His paintings are rare. #221c Pauleus Vital "Still Life with Rat"
* This painting is offered with the caveat that there is some crackling in the paint in the bananas and the avocado . It is slight and not noticable until you are very close to it. There has been no flaking and the hairline cracks have been stable for years.